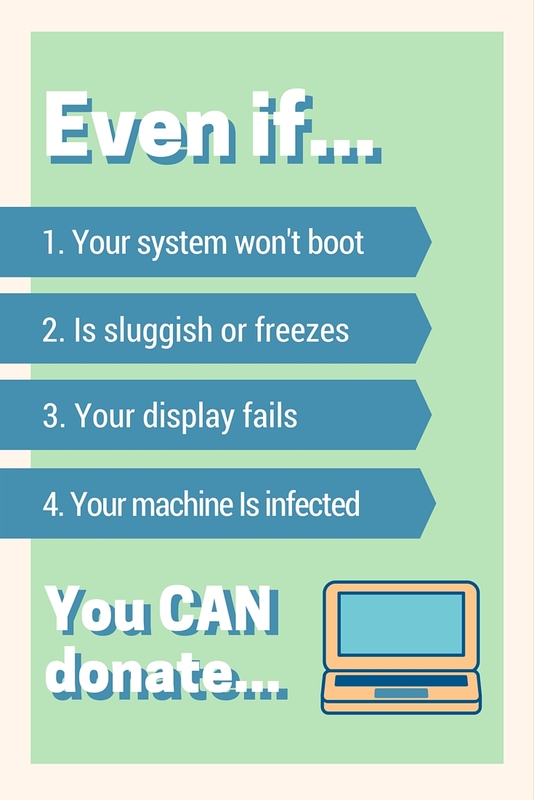 You’ve decided to donate your old laptop computer. Perhaps you'll be getting a new machine as a gift or will soon be making a purchase. Or, you simply want to help out those in need. Either way, that's great! I’ll admit, I have at least a couple of old laptops sitting in the back closet of a spare bedroom. I never knew what to do with them…I felt bad recycling them because I knew in my gut they could probably be put to good use if someone was able to diagnose and fix the issues I was experiencing. And, think about how extending a computer's lifespan increases the return on the environmental cost (as mentioned by TechSoup, "75 percent of the fossil fuels and energy used by a computer are actually consumed during manufacturing"). Make sure your laptop still has life. Check all drives and trays. Wipe all of your old data. 1. Make sure your laptop still has life. If you’re like me, you might not remember why you stopped using your laptop in the first place. Most likely, it was slow, the screen cracked, or maybe the keyboard was missing keys and/or stopped working. Unless you have a motherboard issue, chances are the machine can be brought back to life. This is only a small fraction of what you might be experiencing, but as you can see, most of the time, our computers are still usable, can be revived, and can be given a second life in someone else's hands. 2. Backup your important information. If your laptop is still functional to the point that you can get in and access files (albeit perhaps a bit slower than you’d like), be sure to backup all important documents, spreadsheets, music, photos, videos, and more. How? Drop files into a thumb drive or send them to the cloud. I suggest both backing up physically and via the cloud, just as a failsafe. Use an external hard drive with more than enough space so you don’t have to pick and choose what you keep and what you leave. Here are the best online backup services for 2015. 3. Check all drives and trays. 4. Wipe all of your old data. might not immediatel be removed from the hard drive, and may only be hidden from the operating system. 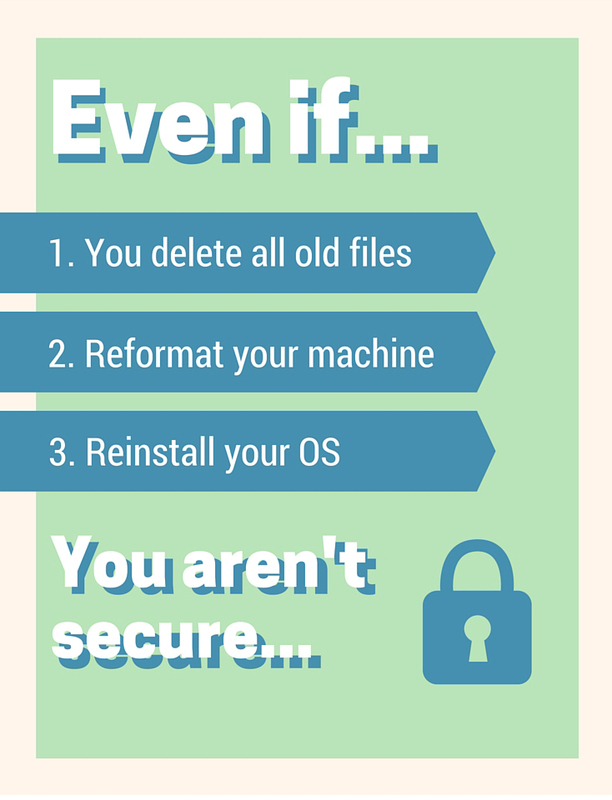 Microsoft states that even a simple reformat or operating system reinstall isn’t good enough. So, the hard drive needs to be wiped completely, and in fact, multiple times if possible. Use software specialized to government standards. Free downloads include Killdisk and DP Wipe. Donating a Mac? Apple offers these instructions on what to do before giving away your mac, including deauthorizing your computer from iTunes, and more.Do know that this is the point of no return! Once your files have been removed through the steps above, they will be impossible to recover. 5. Find somewhere to donate. National Cristina Foundation aims to give technology a “second productive life” and makes it easy for donors to choose a local charity or school to receive their used equipment with a non-profit locator. While there isn’t a cost to you for donating, there are specific requirements to be mindful of. The World Computer Exchange caters to the larger organizations like companies, libraries, or universities in need of donating older equipment. With such large quantities donated, the World Computer Exchange turns around and helps build computer labs in schools in underdeveloped countries. Other notable options include Donation Town, the Make-a-Wish Foundation, and local nonprofit groups, so be sure to check with your city’s website to find opportunities in your area. 10 ways to repurpose your laptop from Lifehacker: Make your laptop work again, mount it as a screen, use it as an emergency wi-fi hotspot or even a tablet. 5 things to do with your old laptop: Create a digital photo frame, repurpose as a second monitor, or turn it into a home server.